The theme for SNS at Funky Junk Interiors this week is decorating with plates and that got me to thinking. Yes, I do decorate with plates. So I gathered together a few photos of plates that I have hung or propped around my home. These blue transferware plates use to hang in the sun room last summer. Then in the fall they were replaced with majolica and brown transferware. At present time ironstone plates grace the wall. These gold color transferware plates are in the master bedroom over my dresser. When this was shared a while back on facebook a person left a comment saying no to plates in the bedroom. What?? The antique French vassilier in the sitting room has a couple old Staffordshire plates propped up. Sometimes the dining table is decorated with plates just because. I have been collecting ironstone for the past two years and have acquired a pretty good collection including plates. The blue transferware plates that were in the sun room (in the first pic) are now in the dining room. This is an old plate that hangs in the hallway that I recently shared. Majolica hangs in the foyer. More blue transferware in the dining room. And the plate rack filled with more ironstone plates. Do you decorate with plates? I love the way you've used plates around your house. Everything looks so pretty. I love them all but I think the blue transferware are my favorites! Have a great weekend! I decorate with plates, too! I have them over the bed in a guest room. Maybe it's a southern thing! I love all your plates everywhere in your home. They are all so pretty. People crack me up sometimes with comments like "no plates in the bedroom"!!!!! Why not?? They are like any other decorations you can hang. Crazy!!! I love how you put them together through out your home. Just beautiful Kim. I love your home, I think I yet told you once! I love decorative plates and I think that they look good wherever you put them! I love decorating with plates too. You've got a nice collection throughout your house! I collect old Imari plates. Always trying to figure out the perfect way to showcase them...I have never hung them on the wall. I love all of your examples. I admire your energy with switching them out seasonally. Somewhere back in the 90's, I began to see hanging plates used in decor and liked it immediately. I first hung some of my mother's vintage china on the wall in her dining room and my sisters both commented that they liked it so I was off on a roll. I am continually looking on Ebay, etc. for groupings I can put together. Yours are simply stunning and my very favorites are the bedroom plates surrounding that pretty mirror! Wish someone would have a day for blog posting entitled "Show off your Wall Plates". No plates in the bedroom? That is just silly. I have three over a mirror in a bedroom. I used to have plates hanging in a bathroom. That would most likely would have upset the no plates in the bedroom commenter. I love all your plates. I used to decorate more with them but don't much lately as it seems I've sold most of my plate collection to make room for other things! Designer Charles Faudree is a big fan of decorating with plates and uses many for wallscapes in his French Country style. No one decorates with plates better that you do! Or has crisper looking bed linens...been thinking about you trying to get my sheets ironed like yours for the one room challenge. Wish you could come over and help me. Une très belle série d'assiettes. Je reste admirative. J'ai un ami qui est un grand collectionneur d'assiettes anciennes. Pretty plates make great wall art anywhere in the house! I've been known to hang them in the bathroom. I am inspired every time I visit, my friend! You have such a knack for making things beautiful! Beautiful collections Kim! Yes I do decorate with plates too! You are the plate queen, Kim! I love the variety of beauties you've displayed all over and how you change them out seasonally! I really want to add a few blue transferware plates ... now, to just find some! Have a great weekend! The way you display plates is so inspiring, Kim! Your ironstone collection is impressive and I love love the plate rack. I'm trying to find one too. Kim, your plate displays are all lovely. I found a plate at the store today that I fell in love with but I didn't love the price. You have inspired me to keep my eyes out for some beautiful plates. I would love for you to link up to 'Saturday Sparks' if you have a chance. Great collection of plates, Kim. I especially like the majolica ones. I decorate with plates, too, although wall space is tight at my house. I love plates anywhere. Would you believe I have them in my bathroom up over the tub? Oh well, I think we can put them anywhere we want, don't you? Love plates on the wall...and you have some beautiful ones!! Hope you are having a good weekend! I love all your plates and of course they look great in your bedroom too, I have seen many plate's collections hanging in little gir's rooms too and they look so sweet. I have vintage children's plates everywhere and I hung some tureen lids on a wall too. I enjoy visiting your blog every day. Kim, it's fun to see how you use your different plates around your home. I like the idea of changing them out seasonally. Yes, I use plates too.....mostly my French faience, but I've a small collection of Majolica too. You have a great collection of plates Kim..and I too love decorating with them. Hello Kim, all of these plates look beautiful! I love them. Have a great weekend. Your entire home is gorgeous! Where can you buy transferware plates? I love your plates! I have a weakness for your white iron collection and for your blue transferware plates. Donna had such a great idea with her plate theme party! Every time you show somrthing I love it. Truly. Your plates are all gorgeous. You definitely have the prettiest plates and you so beautifully arrange them throughout the house.....and no plates in the bedroom?....never heard that before!..They look fantastic over the mirror! Beautiful plates are like beautiful artwork. They ARE art! They should be hung wherever they can be enjoyed. Love the way you can change them out with the different seasons...very pretty! Love all your plates Kim. I need to get some plate hangers. Do you have a favorite? I smash plates for mosaics and I'm not sure blog land is ready to imagine the lovelies having a hammer taken to them. I love plates, Kim and that is definitely the first time I heard the no plates in the bedroom rule. Love all the ironstone and the blue and white. My favorites. You have such a great collection, Kim. I love the one with the soft blue flowers. Ironstone is a mainstay with me. Holy cow Kim, you have a lot of plates! Believe it or not, I don't have any up right now, except for the ones in my dining room hutch, but now I'm feeling as if I'm missing the boat. So as someone who rarely hangs plates (but would like to) to someone that clearly hangs a lot, what's your favorite method for hanging plates? And boy, do you get them lined up perfectly! Also, where have you found all your ironstone? I'm amazed at your collection in only two years. I don't go to a lot of garage sales/antique malls, etc. so maybe I'm out of luck, but thought I'd ask. Thanks! 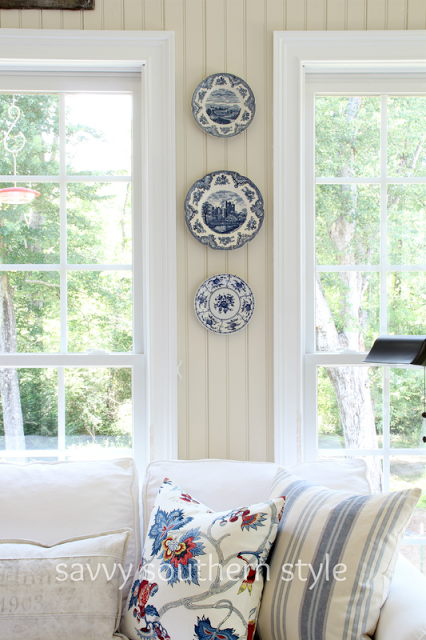 I love ALL your plates, and especially like how you change the plates seasonally in your sunroom! I also have plates, platters, and small bowls around my dresser in my bedroom -- Spode Copeland Byron, a green and brown transferware pattern. My daugher has red transferware plates around her dresser. Another daughter has an arrangement of antique floral plates in her room. Several other spots have plates waiting for them -- they're so versatile and pretty! Kim, I totally wish I lived closed to you.. So I can say, "I was just in the neighborhood and decided to stop by" LOL!!! I am not sure if that same excuse would work with me being in Ca. :) The second picture is just absolutely Lovely!!! Love your plated wall decor! I do like plates on the wall but I don't have any hanging on my walls. I need to rectify that. :) Yours are beautiful.